At 7am my cell phone alarm chimed and then chimed louder. It was Monday morning, time to get up. I rubbed my tired eyes. I had slept long but not slept well. My face felt puckered and punched. A couple of beers by the pier the night before had turned into Jenga and other drinking games at a Farang favorite dive bar. Not a wise decision on a school night. I cursed the balloon like bags under my eyes, showered, dressed, grabbed my helmet and rode my scooter to the Rice Soup Place. The Rice Soup Place is a breakfast spot on my way to school and a ritual stop for my roommate and I. If it has a name I don’t know it. For 25 baht (75 cents) you get a bowl of delicious peppery rice soup, two Thai donuts and a cup of coffee. The RSP had been closed for almost two weeks so I was thrilled to see a line of scooters parked curbside. Sitting down at a sowing machine turned breakfast table I added a dash of crushed pepper and swirl of chili-sauce to my soup, ladled up a spoonful and felt my eyes roll back in peppery bliss. When the soup was finished I tore a Thai donut in half, dunked it into a small saucer of condensed milk and washed it down with sips of hot coffee. The return of the breakfast ritual was just what I needed. I got back on the scooter feeling satisfied, rejuvenated and ready to teach. I weaved through the throngs of scooters loaded up with kids being dropped off and parked in the dirt lot behind the school. I teach at Thidamaepra. Thida is big. 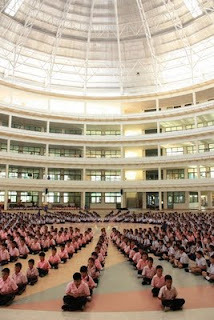 In the morning thousands of students fill the courtyard for assembly activities. As soon as I walked through the gate I was assailed by dozens of hands reaching for high-fives. The foreign teachers are high-five magnets. If you are one of those people who goes elbow deep in hand sanitizer every time you touch a door knob don’t teach in Thailand. You will high-five 400 students a day and at least 40 of those students will leave you wondering “Was that wet hand clean wet or…?” The post poop possibilities are chilling. Holding a giant cup of instant coffee I walked as quickly as possible toward the Teachers Room. I was trying to make it inside before the King’s Song started. I didn’t make it. The music que'd and I hit the brakes. When the King’s Song plays Thailand stands still. It’s like a national game of freeze-tag. Imagine being in an American shopping mall and seeing the whole place stop like someone hit the pause button because the National Anthem started playing. It’s weird and it’s cool. I don’t like having my coffee intake interrupted but I like the national unity and pride that comes with the King’s diddy. I teach fifth-grade or Pratham 5 as it is known here. Most of my classes are IEP (Intensive English Program). But, four times a week I teach general Pratham classes. The students in those classes only have English once a week. I get paid more for the IEP classes but I find the general classes more difficult because the student’s English comprehension level is much lower. My first class on Monday’s is a general class. Joy. Monday marked the start of a new chapter in the textbook called “The Natural World” which I was looking forward to because that meant lessons based on plants and animals and things kids like. My first class was from 8:20 - 9:10, Pratam 5/5. The students were chatty as they always are on Monday mornings so in my best Teacher voice I said “Quiet in 5…4…3…2…1.” When I use the countdown I say the last three numbers silently like I am directing a TV show. I don’t think they understand the Hollywood reference but they do like the silent counting part. It usually works well. Because it was Monday I had to do it twice. I started the class by reviewing what we had learned the previous week. I wrote sentences like, “To go swimming you need _______.” The students had to raise their hands and answer “goggles” or “a swim suit.” The class is split into teams and I give points for correct answers. The points system is a common TEFL technique and it works amazingly well. When classes aren’t behaving I start deducting points, you should see the look on their faces, you would think I was plucking money out of their little pockets. I left 5/5 damp and dehydrated. I didn’t have time to stop for water, my next class was starting two doors down. IEP 5/2, 9:10 - 10:00. I have three IEP classes each with fifty-four students. I see my IEP students every day. Monday the lesson plan for IEP was essentially the same as the Pratam lesson only I asked more complicated questions and expected more complicated answers. Where the Pratam students added “Bird” to the animals list the IEP students tried “Phoenix” and settled for “Eagle” when I insisted on real animals. As the week progresses the IEP classes will get increasingly difficult focusing on things like superlatives, physical characteristics and behavioral characteristics. At the end of the week the IEP students will play my favorite game, Animal Fights! I pair off animals into brackets and the students have to tell me who would win in a fight using characteristics and comparatives. For ten year old kids speaking a second language they can be really creative. Last semester I had my students decide who would win in a fight between a rhino and a butterfly. The girls thought the butterfly would tickle the rhino and make it run into a tree, the boys thought the rhino would wait for the butterfly to land on a flower then eat the flower. I still don’t know which argument I like better but I do know that boys will be boys and girls will be girls no matter where they were born. At the end of 5/2 I had a break from 10:00 – 10:15. 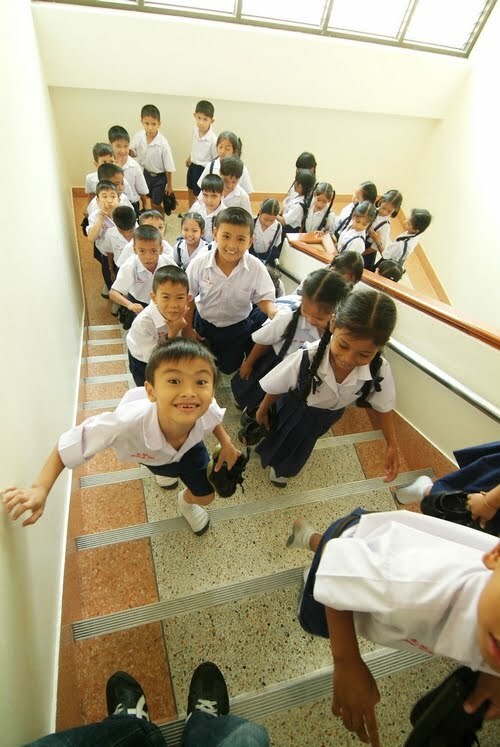 Thai schools are not big on punctuality so this break typically lasts until closer to 10:25. I arrived at my 5/1 classroom just as the students were putting their shoes on the rack outside and taking their seats inside. I taught the animals and comparatives lesson…again. All of this repetition may seem boring but it’s actually nice. It gives me the gift of hindsight. If a lesson runs too long or seems too difficult I can make the necessary adjustments. 5/1 was well behaved. They have to be. Their Thai teacher is very strict. Each of my classes has an assigned Thai teacher to help with discipline if needed. My other Thai teachers observe, laugh at my silly antics and “Shhhsh” the students when needed. The 5/1 Thai teacher is different. She watches with icy intensity from the back corner and corrals the students with a low decibel click-cluck. Seriously, that’s all it takes, a quick click-cluck of the tongue and the students sit ramrod straight and zip-up. The power of the click-cluck is awe inspiring. It’s rare, very rare, but once in awhile I get her to flash a brief amused smile. Every time it happens I have resist the urge to stop class and yell, “Boom! She smiled. Who else saw that! ?” I wrapped up 5/1 at 11:10, it was time for lunch. We get free lunch at Thida. Goodness. Pure goodness. This ain’t no soggy chicken nuggets and box milk lunch, I’m talking about giant vats of rice and huge platters of tasty Thai food. AND…it’s all you can eat. 11:10 is early for lunch but on Monday it came just in time. If I was a video game character my life bars would have been dangerously low. I needed fuel. They were serving Massaman Gai. I almost wept. Massaman is freaking delicious. Imagine a stew with slow roasted chicken, big chunks of potato, carrots and onions, BUT instead of a typical stew broth it is bubbling and marinating in a spicy Indian curry sauce with peanuts and a hint of cinnamon. It’s like Momma’s own got shipped around the world collecting herbs and spices and far flung flavors until it came back something familiar and something delectably new. I ate two bowls. I washed it down with a cup of Milo (Thai Ovaltine) and booked it to my 5/3 class, 12:10 – 1:00. My final class of the day was Pratam 5/5, 1:55 – 2:40. Animals. Comparatives. You know the drill. At the end of class I grabbed my bag (a sweet authentic army rucksack I bought at a second hand store) and my helmet and called it a day. On the way home I picked up my laundry clean and folded for 30 baht. At home I changed clothes and slogged my way through an uninspired workout. I showered. I changed. I settled into my extremely comfortable satellite chair, cracked open Big Sur by Jack Kerouac and commenced chilling. Monday: a day like any other day.